Those who entered service as young enlistees, eager to know what men know, and do those things that men do—or at least what they think men do—will see their reflections in this book. Combat veterans may find themselves drawn into the action by McGee’s honest prose. Accounts by other participants in the action broaden the scene and color it deadly. You might catch yourself resisting the urge to look behind you for a Japanese plane, its determined pilot boring in at your back. War called McGee toward the sea to make ships. At 17, he enlisted. The Marine physical ruled him out, so he joined the Navy. 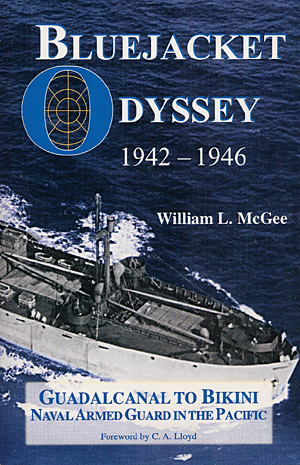 The fastest way to the open sea, and the war waged for its control, was through gunnery school and a berth aboard a merchant vessel as a member of the Navy’s Armed Guard….McGee and his shipmates lived through a series of surprises, their world expanded as for puppies escaped from their world in a cardboard box. Innocence gave way to experience to the survivors. After war’s end, McGee was reassigned to a modern warship. He sailed aboard it to a long, memorable post-war Navy experience: the beautiful, but sobering, Bikini Atoll atomic bomb tests….In four years, McGee grew away from the innocent, young cowboy—who didn’t get away with using ‘heck’ or ‘darn’—into the salty life of a young sailor in a world at war. READ WHAT OTHERS ARE SAYING . . .
—Charles C. Espy, Lt (jg), USNR, SS Thomas Nelson Armed Guard C.O. —E. V. Clothier, Dagenham, Essex, U.K.